Outdoor Dog Play Area Tips | Pamper Your Pooch like Royalty! As Americans, we love our dogs. It is estimated we spend a base amount of $1,270 on them every year. Keep in mind, that does not include special outings, overnight stays at a pet lodge, trips to special events or any other type of special pampering we give our pooches. It’s clear we love our dogs. So why not create a special outdoor dog play area with synthetic grass? It’s not hard and your pet will love it. Following are some ideas on how to create a drool worthy pet space. These ideas will help you create the ultimate outdoor dog play area. it’s not as hard as you may think. And with synthetic grass, it’s even better! Speaking of, look at our first point below! Instead of going with a traditional lawn that must be maintained, use synthetic grass. There is no better foundation and the benefits are endless as they relate to creating an outdoor dog play area. Consider the following. No Dirt. Did we just make that claim? Yes, we did. Synthetic grass does not require any soil so therefore, dirt and grass clippings do not track inside your home. Also, no muddy paw prints after it rains. You might actually be able to buy white furniture again. Green Shade. It’s no secret. Grass will not grow in the shade. So that nice tree in your backyard that provides shade also produces a nice bare spot. Installing artificial grass will create an evergreen shady area your dog will love! Easy Clean Up. Pet waste and synthetic grass are no problem! Simply remove the waste with a bag as you normally would. Then rinse or spray off the affected area with water. You may even consider putting a post in the corner of your yard, away from your artificial grass, to mark an area for use. It may take a few times, but since dogs are territorial, planting a post will give them a space to mark! Fencing can be obtrusive or inviting, it’s up to you. And while they are necessary to divide space, there are ways to make them engaging. For instance, place a few trailing or climbing plants along the fence to soften the look. You can keep them in containers and train them for a bit until they takeoff in the direction your prefer. The plants will look great against your synthetic grass and won’t compete. Plus, flowering vines are cheap! Hence, you won’t spend a lot of money covering up your fence! But what if your fence is solid instead of chain link? Well, if your dog is more curious than snappy you could install a viewing bubble. They look cute and are a great way for your dog to engage people as they pass. Hey, you might even meet a few new neighbors too! Give your dog a house they can really enjoy. You can build one yourself or buy one online. The important thing to keep in mind is space. Adequate space ensures proper ventilation. Your dog can enjoy the outdoors while remaining cool as a cucumber. 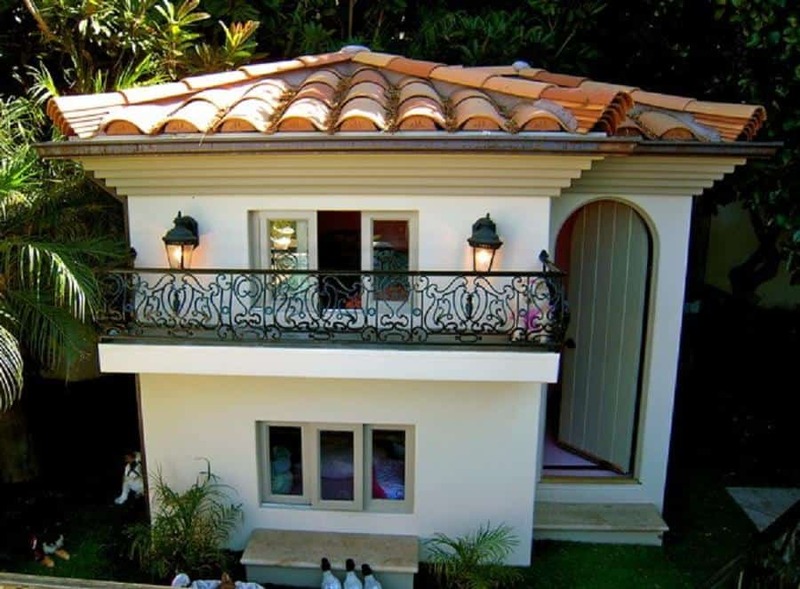 Also, the right dog house can be a design statement. Add whimsy, drama or define a space in your artificial grass yard with the right structure. Why not add a bit of fun? Since you are designing an outdoor dog play area, consider implementing some play equipment into your plans. For instance, you could add a tunnel. Dogs love to run, hide and explore. A good tunnel gives them just the place to do it. In addition, you can add hills, incline ramps, a doggy see saw and many other pieces of play equipment. 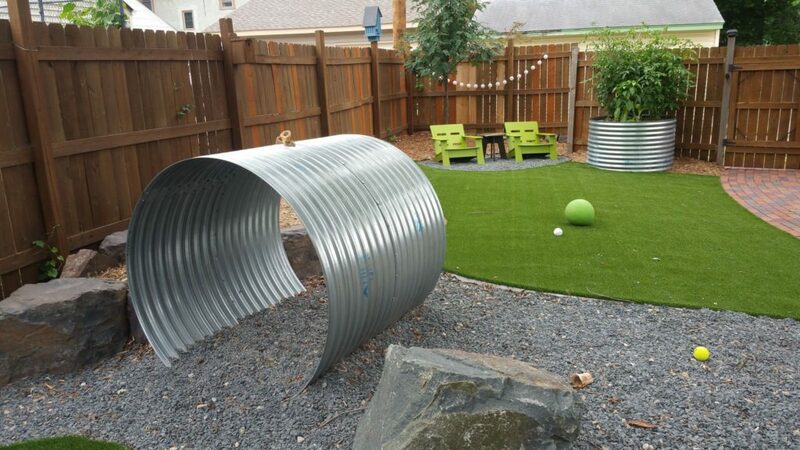 Incorporating a few of these can transform your drab dog run into a true outdoor dog play area. However, the benefits of a synthetic grass outdoor dog play area aren’t just for your pooch. owners stand to gain just as much if not more! Let’s briefly look at a few reasons why synthetic grass makes sense. 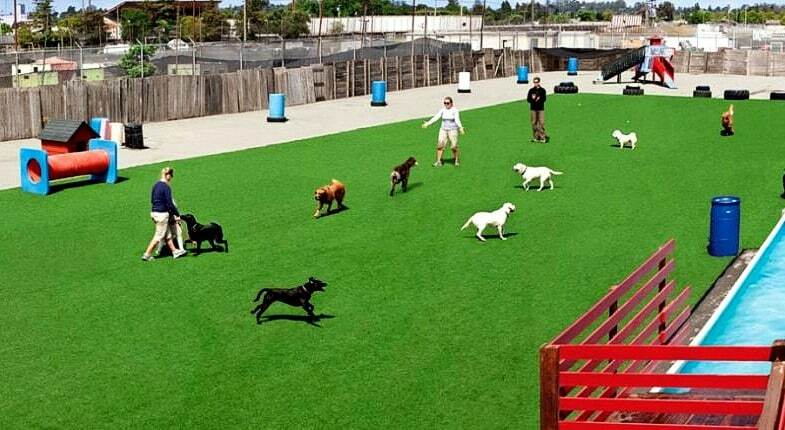 Why Synthetic Grass for Dog Play Areas is a Great Idea for Owners! First, synthetic grass requires very little maintenance. No lawn equipment is required, which yields a one two punch for you. Think of the money you will save. No lawn equipment means no gas, oil, or service requirements. That’s good news for you. Second, think of the time you will save. Instead of sweating it out, you can relax and enjoy your lawn alongside your pet! Also, there are several other benefits. Consider this. That water bill? With synthetic grass it just got a lot lower. No need for sprinklers, drip irrigation or watering mean lower water bills. In California that translates into real money back in your wallet. We work hard for our dollars after all. So why not let synthetic grass let you keep some of yours? You might even be able to splurge for a few extra pieces of equipment for the play area. Finally, think about the return on investment. After a few years, your lawn pays you back! Not only do you have an amazing outdoor dog play area, now it’s paying you! Even better, artificial grass installs are warrantied and can sometimes last well beyond their warranty. Of course we can’t guarantee that, but it is good to know installs are designed to last! It all depends on the type of grass you choose and we happen to new a company who can help you with that! So now you have no excuse to create an amazing outdoor do play area. We have given you several creative ideas as well as the incredible benefits synthetic grass has to offer. The only thing left to do is call NewGrass to get the process started. We have amazing products you can use to create the perfect play space for your pet. If you want a neatly trimmed look, we can give you that. Perhaps you prefer something more shaggy? We can help you with that too. Contact our sales staff. We promise to come up with something your pup will love!.